I believe one of the problems with the human condition is that we all say we want to receive but deep inside, we really shun receiving and we look down on “asking”. In my spiritual wisdom today, after so many years of spiritual study, practice, and everyday application, I now see this battle between what we say we want, (abundance), and what we actually feel, (unworthy), as the reason to the experience of lack in so many of our lives. If you attempt to accomplish anything on the earth plane by being uncertain about its manifestation, you will never achieve the desired goal. When working with the Universe, it is so much more crucial that we know what we want, really want it, and know that if we can desire it, we are worthy of it. And we must make peace with our fear of asking and receiving. The Universal law of reciprocity states, that as we give, so shall we receive of equal value, our rewards in return. This law is a law we need to understand. Because just as we desire and actively give of our gifts, talents, knowledge, and skills to the world to help all of us become better humans, we should be receiving in the same way. For many of you, this will be uncomfortable to read. Because we have been so deeply and thoroughly taught that it is “better to give than to receive”. Once again, as the Un-teachers, we say to you that they are both equal in their goodness. Just as the day is equal to the night, the sun to the moon, the earth to the sky. By learning that there is shame in asking, we have dealt ourselves a set of cards that are quite difficult to play, because our thoughts and beliefs have been trained to go against the current of the universe and how it actually works. Giving and receiving are one. As Andie says, two sides of the very same coin. In certain schools of Buddhism it is taught that when you give, you are only giving to yourself anyway. Why? Because when and whatever you give, will always by law be returned in its value to you, and most of the time not from the person or direction to which you gave. Some of you will say right now, I have given and given, and received nowhere near as much as I have given. I say to you, that you would only feel this way, if your heart is closed to the gifts you have received from those acts of giving. And I will not back down from that. There are many, many things in our human experience that hold tremendous value. Many of the hardships I have experienced have changed me so positively in so many ways, that I carry with me a new Kimm for the rest of my life who is able to achieve and accomplish things the old Kimm without enduring those hardships, would not be able to dream. 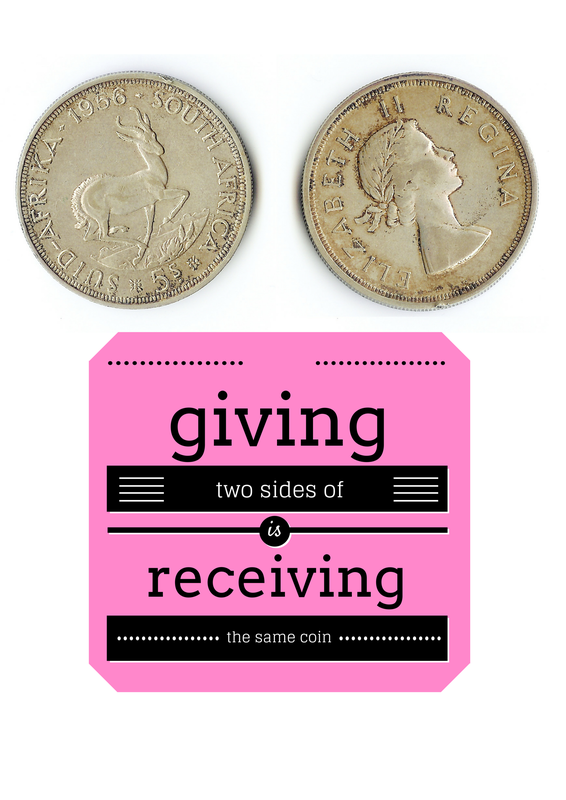 So let us all stop seeing “giving” and “receiving” as two separate actions. They are not. They are the same. And until enough of us can un-learn the damaging lies we have been taught, many out of human love, we will have the experience of lack continue to run rampant through our lives and our planet. And this post I give to you, while receiving this important reminder for myself.